Audio-Technica's PRO 92cW wireless omnidirectional condenser headworn microphone offers a natural, smooth frequency response optimized for vocal articulation. 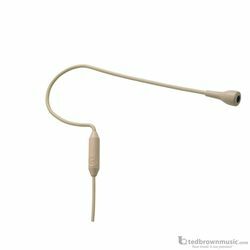 The mic features a small condenser capsule; a lightweight, contoured earpiece; and a flexible boom that is easily repositioned for a comfortable fit. Terminated to fit Audio-Technica wireless systems, the PRO 92cW is available in black or beige.